The Industry 4.0 revolution is enabling new levels of automation, including a new generation of automated guided vehicles (AGVs) for use in the first wave of smart manufacturing and distribution facilities. This revolution also requires new ways of thinking across all aspects of materials handling, especially when it comes to functional safety and reducing accidents in the workplace, and in turn, presenting a new challenge to sensing and control manufacturers. 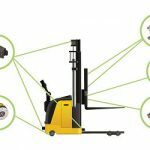 The adoption of AGVs into the materials handling ecosystem has been far from spectacular, but all that is changing with the fourth technology revolution and the rise of the inter-connected workplace. AGVs currently represent about 10 percent of the global market for automated materials handling equipment. The future of AVGs will undoubtedly be autonomous – systems that are adaptive and feature intelligence-based capabilities that allow them to respond within boundaried domains to situations that were not pre-programmed in the design. Autonomous vehicles for use in factories, industrial facilities, retail outlets, warehouses, etc., can be categorized into four distinct ‘types’: forklift trucks (moving goods horizontally and vertically); pallet lift trucks (horizontal only); tow vehicles; and unit load carriers (to convey heavy goods from conveyor to assembly line). Today, most AGVs are deployed to automate materials handling and packaging logistics, with man and machine working together. A few companies are taking automation to the next level by adding a robot arm to pick the desired object, taking man completely out of the equation. While this is where the industry is heading, object recognition and grasping are two of the biggest challenges yet to be fully resolved. So why are manufacturing and logistics facilities increasingly moving towards AGV-based solutions? One of the reasons is that in the long term, AGVs have been shown to be more efficient and cost-effective than human controlled materials handling equipment. In addition, AGVs are intrinsically safer, for they remove the issue of operator error. Arguments against, however, include the high level of initial capital investment required and that not all sites can accommodate such systems on the floor. But perhaps the biggest barrier to the wider adoption of AGVs is that there is not yet a single navigation technology against which a consistent standard can be set, compared, and measured. There are many types of navigation technologies in the market but some (like wire, optical, and spot) are now less frequently used. AGV manufacturers most commonly consider the four following technologies for new equipment/installation. In magnetic navigation, various light-duty AGVs use magnetic tape for the guide path. One major advantage of tape over wired guidance is that it can be easily removed and relocated if the course needs to change. It also removes the expense involved in restructuring the floor of the factory or warehouse. A limitation of this method is that the routes have to be fixed and well defined by the tape. If any obstacle is detected in front of the AGV, it stops and waits for the problem to be solved (for example, the obstacle to be removed) before it restarts. Laser-guided navigation is similar to an electronic eye, which by means of reflectors positioned on the surrounding walls, uses triangulation to determine the exact position of the vehicle to allow it to carry out the required tasks in the operating area. The advantage of laser-guided technology is that it requires no floor work as in the case of magnetic guidance systems. Additionally, route changes can be made easily via software updates to ensure maximum flexibility for company logistics. Vision-guided vehicles (VGVs) use optic sensors (cameras), in addition to other sensors such as speed or laser sensors, to navigate, and software within the vehicle effectively builds a 3D map of its operating environment. This technology allows the vehicles to operate in automatic or manual mode for maximum flexibility. 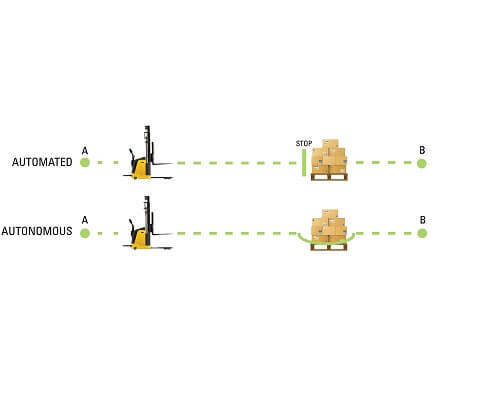 AGVs based on natural navigation technology do not require reflectors or markers so they require less installation time and are easily integrated into existing systems, minimizing the impact on current operations. In this type of navigation, LiDAR, light detection and ranging, is the main technology used. A variety of configurations can be used to provide steering control in AGVs. To determine what method is the best fit for a particular vehicle and application, four factors are usually considered: the ease of building; the steering and driving capabilities; the ability to navigate in confined areas; and the overall cost of the vehicle. Selecting the appropriate steering control is fundamental in order to reach the right compromise between performance and cost for any given application. The three most commonly used set ups for steering control in AGVs are the three-wheel, differential, and quad configurations. The three-wheel configuration is the most common solution for lift truck AGVs. They are relatively easy to implement and provide very accurate control. Frequently, this design relies on encoders to monitor and measure the speed and direction of one master wheel that determines the vehicle’s movement. The differential configuration is a popular solution for unit load carrier and tow-vehicle (or tugger) AGVs since it is possible to rotate around the center of the vehicle, although with some turning limitations. The steering control is achieved using different speeds in either forwards or backwards directions on the two-controlled wheels, where a single motor and an encoder are used on each wheel. A quad wheel configuration provides the most maneuverability as it permits 360 degrees of movement in any direction, making it the ideal solution for unit load carriers. The ability to steer the vehicle in a sideways or crabbing motion allows for better and more accurate navigation in tighter and more challenging spaces. As there are more wheels that require steering controls and accompanying motion control components such as encoders and sensors, this type of configuration is the most complex. 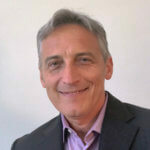 About the author: Alessandro Bosio is a Global Segment Manager at Sensata Technologies where he is responsible for developing and executing market strategies for various industrial engineering segments such as Material Handling and Industrial Autonomous Vehicles. He has 20 years of experience in industrial automation and process control, with a global view of market needs as a result of his experience working in both Europe and Asia, as well as in the U.S. where he currently lives. Alessandro Bosio is a Global Segment Manager at Sensata Technologies where he is responsible for developing and executing market strategies for various industrial engineering segments such as Material Handling and Industrial Autonomous Vehicles. He has 20 years of experience in industrial automation and process control, with a global view of market needs as a result of his experience working in both Europe and Asia, as well as in the US where he currently lives.